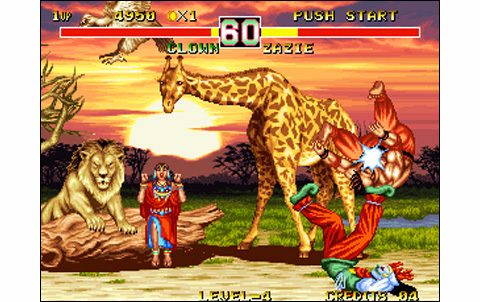 Versus fighting fans, here's a game that might actually surprise you. 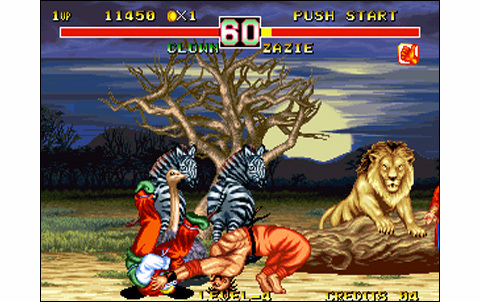 In fact, not really with its originality: Data East were involved in a lawsuit with Capcom, because of their game 'Fighter's History' that was a little too much inspired from Street Fighter II. The complainant having lost the trial, the road is wide open then for our dear friends of the japanese company to re-offend joyfully its victims, with Fighter's History Dynamite aka Karnov's Revenge. the sequel to its previous-game-that-was-more-creative-than-people-thought! 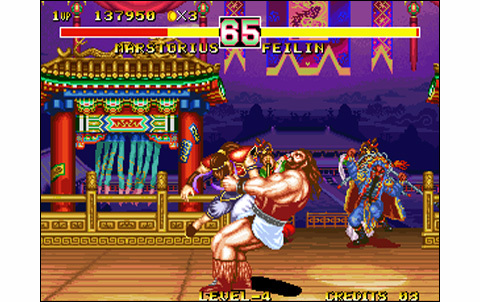 Karnov was the Boss in the first one, this is still the case but he's now selectable. Thirteen warriors more ridic... uh, strong as each other, will compete in a world tour of martial arts. Each one has its own martial technique... 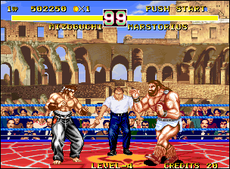 Choose your favorite moron, and go for a series of combats that will not resemble, but then not at all to Street Fighter II. Let's review this incredible bestiary. Karnov is the boss of the game: a ruskof plump, stuffed with vodka and potatoes, fire-eater at Barnum's. 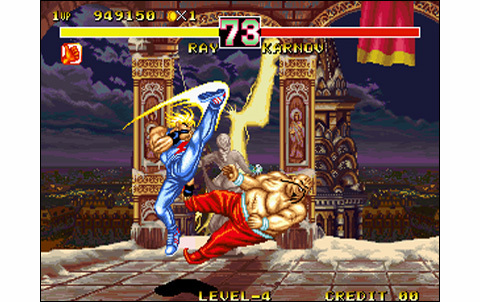 Ray is a major character in the series: the blond athlete, with balanced stats, both fast and powerful (a second-hand Ken). 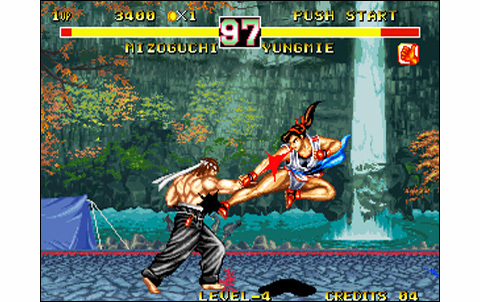 Mizoguchi is his alter-ego, but quite different in his fighting style: slower but stronger, it's probably the most charismatic of the game (you guessed it, the rest is going to hurt... very badly). 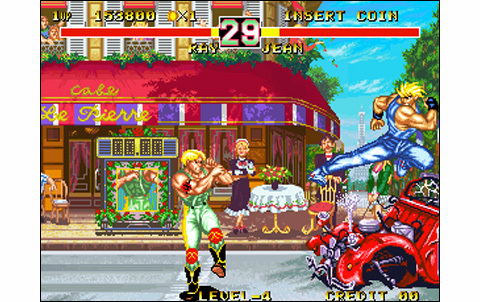 Jean is the good French queer, as seen by the japanese: strapless, mold-balls and a face you want to slap hard. 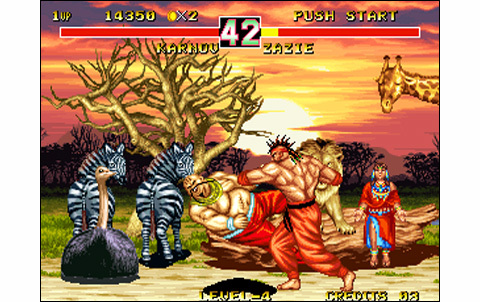 The african Zazie (that's a low blow)... practice karate, the italian Marstorius is the big fatty of the group, Lee's name could have been Bruce, but it was a chance of getting another lawsuit; there's also the thaï boxer SamChay (can't you see) and the ridiculous Matlok and Clown : respectively a punk with a totally messed up look and... a clown (!?). 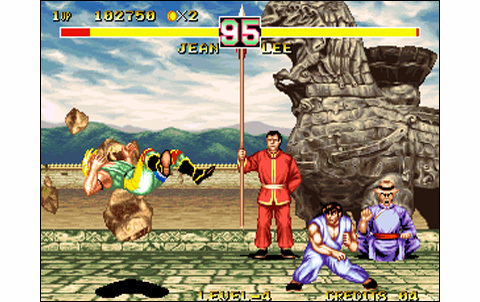 About chicks, we have Yungmie, aka Mrs. large thighs that would have Chun-Li look like a small opera rat, judoka Ryoko borrowed from World Heroes 2 (ADK, no lawsuit, thank you). Not to forget Feilin, that looks cute at first, but is actually a travelot from Shanghai. So who will you choose from now??? 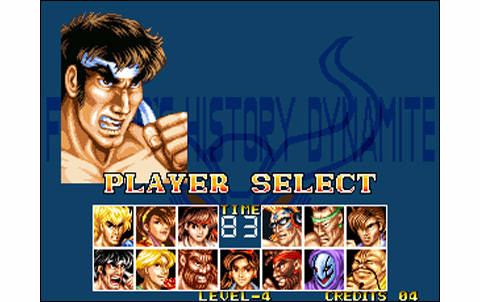 Thirteen playable characters, it's more than honest. The gameplay is well thought - while not too innovative - and not totally ridiculous, but still not playing in the same league as the pundits of these times. 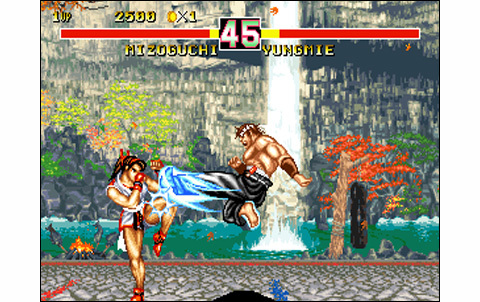 Two buttons for punches, two for kicks, ability to dodge back are the basics. 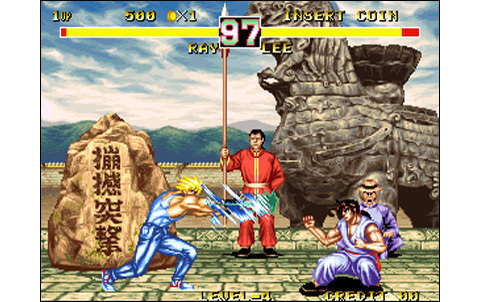 The game is fast and features damn many combos. 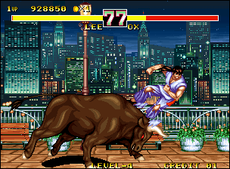 About special moves, it is rich and there's even some hidden special moves, executable without conditions, but at the cost of a complicated combination. The roster is not the most balanced ever, not the most beautiful ever, not the most charismatic for sure, but there's something fun here, and the game mechanics - without being particularly precise and technical - are pleasant. The characters are mostly well designed and animated, Data East did a good job. 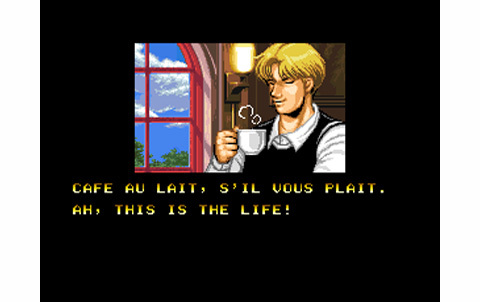 The backgrounds change over rounds (two versions, generally day/night) and some stages such as Zazie's with its sunset, Jean's Café Parisien or even Kremlin's terraces show beautiful drawings rich of details. The quality is unfortunately not equal for all places: rain at Lee's is completely failed, Feilin's in China too and the dockside from Ray's is really not so good. Let's be fair, and confess that the whole graphic work is worth it. 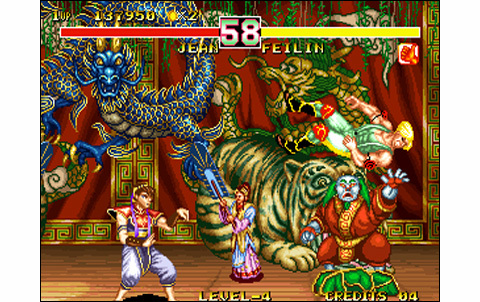 In addition, backgrounds are richly animated, and almost all feature destructible elements. The soundtrack is a little lower than the rest in terms of quality, being substantially inferior to contemporary SNK titles like Samurai Spirits II or Art of Fighting 2. The numerous voices are sometimes ridiculous, but stick well to the characters... The musics are harmless and to be honest, none is really striking: they accompany the game without a hitch, as for the sound effects. In short, nothing to complain about here. 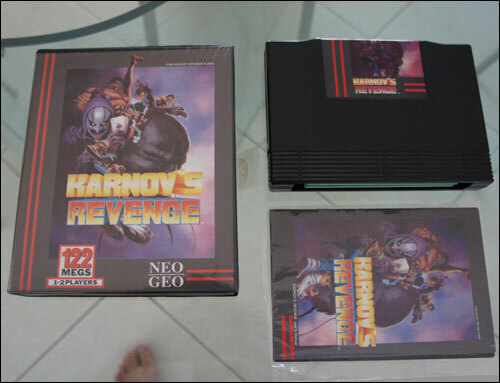 The realization of Karnov's Revenge is above average, its roster decent, gameplay in the standards of the time... but overall still a good notch below the contemporary blockbusters. It is clear, Data East's game is part of the 'Minor-League' in the world of VS fighting. The soft is fun, comprehensive, handsome, and the characters are funny enough to give a smile. 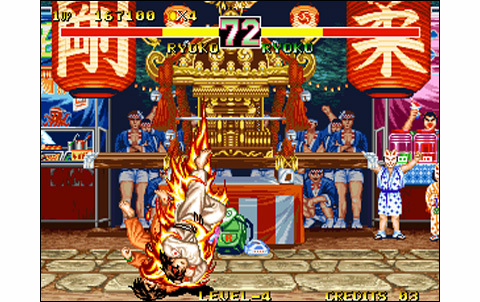 Innovations aside, few things will be remembered - if not the stun system, linked to a clothe worn by the fighters - as mechanisms are hugely inspired from Capcom's games. 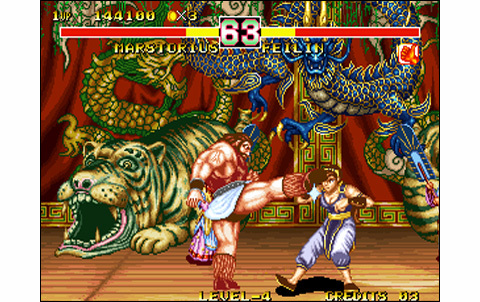 Finally there is a bit of exotic things that pleases players in Karnov's Revenge, a fighting game worthy of the finest Chuck Norris or Jean-Claude Van Damme movies. Very good things come next to mediocre ones; overall, the work on sprites or stages looks good, despite the tremendous lack of charisma for characters. Fast-paced, with a good decomposition, animated and destructible sets, and a line by line ground scrolling. Good! Themes are nothing special to be remembered. 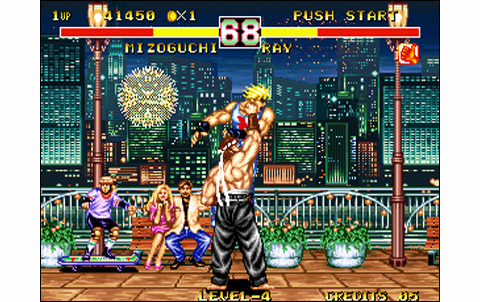 Impact noises and other effects are powerful, but still average for a Neo Geo. With its thirteen different characters, the choice is decent! Versus is fun, and the game difficulty is awesome. 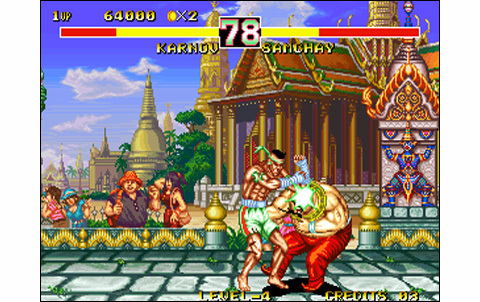 A gameplay quite similar to a SFII 'semi-turbo'...! 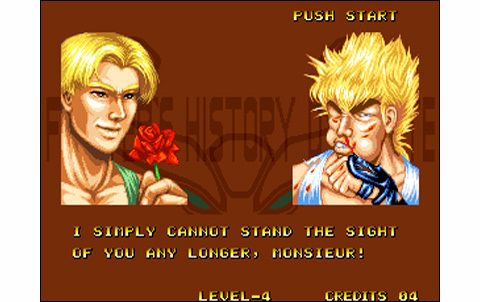 Indeed, balance is far from perfect, and precision of hits too... and i don't talk about the fighters' charisma! KR is fun and taking with a Street-Fighter-wannabe gameplay. If you don't take it too seriously, it can provide some good times! From 40 to 60 euros respectively for the japanese or euro AES versions. 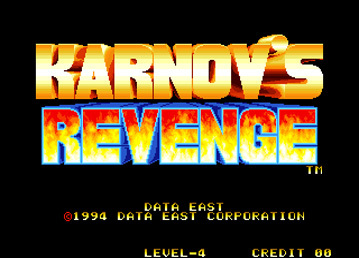 If you love cheesy movies such as Ninja Terminator, Invasion USA or Crocodile Fury, the Data East masterpiece Karnov's Revenge is waiting for you with wide open arms.